CLIF® Bar unwraps its holiday energy bar offerings with a scrumptious new Hot Chocolate flavor. Crafted with organic ingredients by athletes and foodies in the CLIF Kitchen, all CLIF Bar seasonal flavors deliver delicious and wonderfully wintery nutrition for sustained energy. 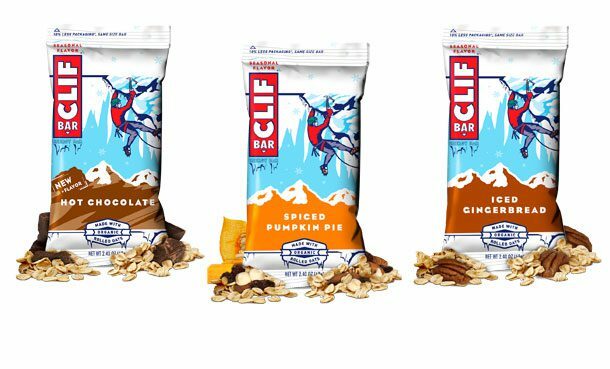 Now in its 13th year, the limited-edition CLIF Bar seasonal lineup includes: Hot Chocolate, Iced Gingerbread and Spiced Pumpkin Pie. All three seasonal flavors are available nationwide while supplies last (SRP $1.39). CLIF Bar will donate 1 percent of net sales to Protect Our Winters, a not-for-profit organization fighting against climate change. CLIF Bar and Protect Our Winters are dedicated to educating, engaging and mobilizing the winter sports community to protect the places we play.